For Windows 2008: Navigate to Server Manager > Roles > Web Server (IIS) > Internet Information Services (IIS) Manager, then look under your machine name > Application Pool. 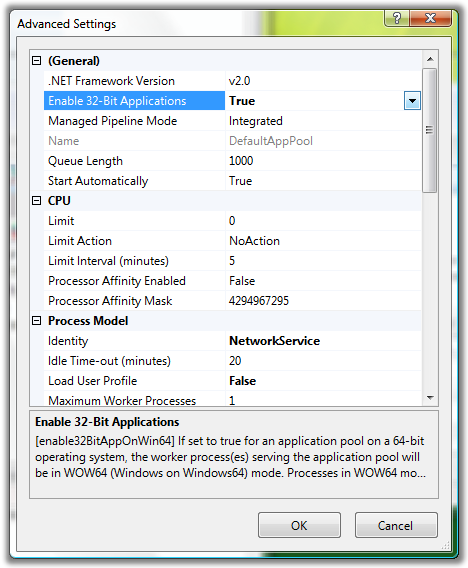 For Windows 7: Navigate to Programs > Administrative Tools > Internet Information Services (IIS) Manager, then look under your machine name > Application Pool. enableParentPaths="true" //启用父路径 bufferingOn="true" errorsToNTLog="true" appAllowDebugging="true" appAllowClientDebug="true" scriptErrorSentToBrowser="true"